You are proud to own a pickup truck. Chances are, though, that your friends and loved ones are equally proud of your vehicle. When you aren’t helping to load up a coach, chances are that you are out in the wilderness taking on the worst elements. From friendly moving services to the gnarliest off-road trails, you want to protect the truck that gets you through life. If you are looking for quality truck accessories in Williston or the surrounding areas, we’re ready to help! Alpine Truck Accessories provides beautiful, durable bed liners to keep the bed of your vehicle protected at all times. North Dakota is known for inclement and inconsistent weather, and daily use can quickly begin to wear out the integrity of your truck’s bed. It’s vital to find protective truck accessories to keep your machine in good shape for the long haul. Our local truck shop is here to help! Many vehicles come stock with rigid plastic bed liners that serve to protect the integrity of the bed beneath. These drop-in bed liners are molded to fit your vehicle, fastened with bolts and other securements for peace of mind in any conditions. Protect your vehicle from scratches, dents, abrasions, impacts, and more with a cost-effective product such as this. Many people enjoy the return for this price point, so be sure to speak with our professional team before purchasing your truck accessories! Those looking to take their protection to the next level can benefit from our Line-X services. Alpine Truck Accessories is now an authorized Line-X provider, delivering the highest level of conformity and protection to ensure long-term success in keeping your truck safe. Talking about the best results and delivering them are two completely different concepts, and our spray-in bed liner services ensure you leave satisfied with the results. Standard – Investing in the basic package does not mean that your vehicle will be vulnerable. This Line-X service works to prevent staining from harsh chemicals, prevent rust and corrosion, and absorb impacts, all while being VOC-free with a lifetime warranty! Premium – This bed liner service includes the same level of quality as the standard, but with an added layer of UV coating for optimal sun protection. Your product is made to last a lifetime, so why not invest in services that keep your bed looking new for years to come? Pro – When protection and durability are needed at the highest levels, you can rely on our Pro services to provide professional-grade results that are sure to impress. Not only will this spray-in bed liner look great in your truck, it is also 300 percent tougher than the industry standard! Platinum – Anyone interested in protecting their vehicle at the molecular level can benefit from Line-X Platinum products. This advanced polyuera technology provides the perfect bond for a lifetime of quality. Your bed will be tough, durable, and resistant to the sun. 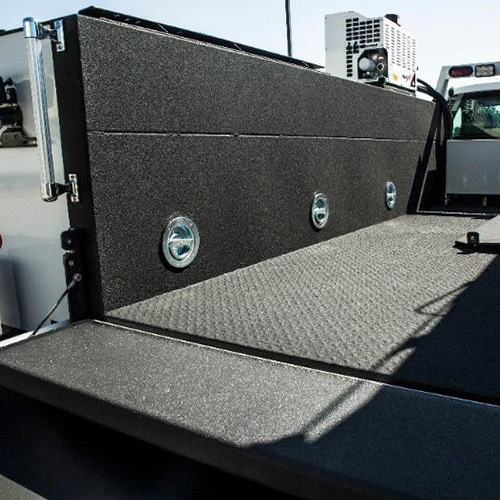 Maximize your investment with a spray-in bed liner from Alpine Truck Accessories!